The sign beckoning to traffic on Leonard Street outside the Ferris Wheel in Grand Rapids had become a blind spot for Mike Ferris. Every time Ferris looked up from his bar the sign was framed by the window right in front of him, but when you see the same thing every day for 10 years you kind of stop seeing it altogether. For Ferris, his sign had become like a beer you can’t find when you open the bar fridge — until someone points it out at the front of the shelf, eye-level. Unfortunately, the one who had to point out the sign this Wednesday morning was Ron Jones, the rep for Bell’s Brewery. “That’s not gonna be good for business,” Jones said as he blew in through the door and nodded toward the window. Ferris was embarrassed, and a little nervous. He didn’t have much to bargain with these days, but one thing he did have was prominent roadside signage, which he had promised to Jones for a good price on Bell’s new Oberon Ale. He didn’t want to slight a guy who was giving him friendly discounts while he got things squared with his lawyer, yet here he was having to explain himself. It seemed like that was all he’d done in the year since he got his summons. “Sure thing, Ron,” Ferris said. As soon as Jones was out the door, Ferris asked Troy in the dish pit to take care of the sign. He brought a tray of glasses back out to the bar with him, and as he restocked the counter he wondered if he should call the cops about Lois. Lois Grainger had been a regular on Scrabble nights at the Ferris Wheel for years before local businesses started to go under and Ferris decided he had to try a different Tuesday promotion. The slowdown wasn’t just a Grand Rapids thing — offices were shutting down all over the country, but Grand Rapids made a lot of office furniture so the city wasn’t exactly immune. Ferris’s new idea was sports trivia. He had a great location near the hockey rink but realized he wasn’t taking advantage of it — hockey players and puckbunnies weren’t much for Scrabble. So he started bringing in Skipper Lowe, the afternoon drive host, on Tuesday nights to quiz the locals on the Tigers and Wings and Big Ten football. Justin Grainger loved it. He was Lois’s son and her usual ride home from Scrabble. Ferris had once coached Justin’s eighth-grade hockey team and thought the big winger might make the Spartans one day, but Justin turned out not to be the college kind. He did play in the Tuesday night men’s league as a high schooler, though, and after he turned 21 he started bringing his teammates by the Ferris Wheel for a beer after games. They’d tolerate the Scrabblesphere until their pitcher was nothing but suds clinging to plastic, at which point Justin knew it was time to take mom home. Tuesday nights at the Wheel became a whole different thing after the change. The hockey teams who finished early would roll in, get the trivia going, and keep it going until the late games ended and other teams took over. They’d all cross paths at 10 p.m., when the only table you could get was beside a pile of hockey bags in the corner that didn’t smell very good. The happy chaos of players, girlfriends, and other hangers-on coming and going in shifts throughout the night reminded Ferris of his eighth-graders making their line changes, with players swinging their skates over the boards and crossing in both directions as one line came off and another went on. You couldn’t get Justin Grainger off the ice back then. His linemates would change, but Justin would stay out for another shift, sometimes two. Ferris would chew him out for it after the game, because as good a player as he was, it was pretty obvious when he was running out of gas. That was the big difference between the rink and the bar. On the ice, you couldn’t hide; the coach was always watching. In the bar, well, Ferris was too busy pouring pitchers and stacking glasses to notice who was putting in the long shifts and besides, he wasn’t their coach anymore. Ferris felt bad, but the switch from Scrabble to trivia was probably the reason he was still open and The Bullhorn wasn’t. Without trivia night and good relationships with people like Ron Jones, the Ferris Wheel might have stopped turning. That reminded him: How was Troy coming along with the sign? 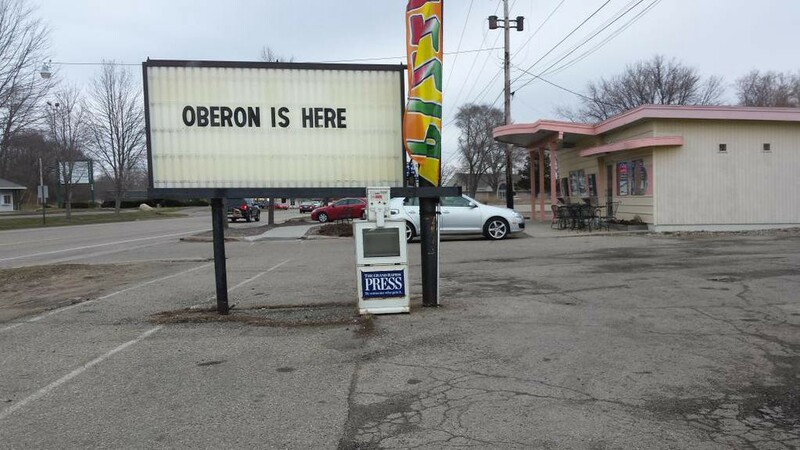 Outside the window, he saw his dishwasher slotting the final plastic ‘E’ into place: OBERON IS HERE. Ferris rummaged under the counter for a box of Oberon Ale coasters Ron had left with him on Friday. He used them to replace all the Heineken coasters in the racks. It was the least he could do. His legs felt a little shaky, but Ferris stooped over and picked up the ‘I’ from the gravel underneath the sign to give to Troy. He walked back across the lot toward the front door. The sign was behind him. Today he would call the cops. This was an exercise in flash fiction that I was put up to by Chuck Wendig at terribleminds. You might call it content strategy or communications. I call it storytelling. Former digital boss @theprovince and editor of @provincesports.